Dr. Hallett has spent his entire career as an Indiana licensed chiropractor with practices in Attica and Lebanon prior to joining Dr. Seland’s Fisher’s clinic. Graduating from of same class at Palmer College of Chiropractic in 1994, Drs. Hallett and Seland began their chiropractic journey in the State of Indiana. Dr. Hallett joined Dr. Seland’s successful Fishers chiropractic practice in 2014. Dr. Hallett brings a wealth of clinical experience handling chronic conditions such as disc disorders, reflux/heartburn, irritable bowel/colitis, and migraines. Dr. Hallett overcame childhood asthma (by the grace of God) to become a long-distance runner; something he still enjoys. His PR’s are as follows: 1500m (4:00 age 20), 1600 (4:28 age 17), 3200 (9:40 age 17), 5K (15:07 age 21), 10K (31:55 age 20), half marathon (1:21 age 15), Marathon (2:58 Chicago 2005 and Boston 2006). He and his son completed the 2018 Indianapolis Mini Marathon and 2018 Monumental full Marathon. Because of his extensive running background, Dr. Hallett also enjoys troubleshooting structural problems of the hip, knee, ankle and foot. 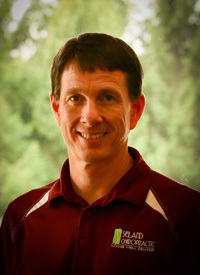 Dr. Hallett has maintained post-graduate training in Palmer chiropractic technique, Class IV Laser therapy (K-Laser), Radiology, Extremity problems and soft tissue injuries. Whenever Dr. Hallett is not at the office, he enjoys running, reading, and family time. They have 3 adult sons and 1 granddaughter. We’d love to meet you and answer your questions. Give Seland Chiropractic Living Well Center a call today!